Some interesting clues to the future of Tamriel may have been hidden within the latest beta patch, including a new playable island. An intrepid code junkie has mined the core of the latest Skyrim beta and found what appear to be clues to its next DLC expansion. This all needs to be taken with a grain of salt, but the hints he claims to have discovered reveal not only the name of the DLC, Dragonborn, but also that it will take place on the island of Solstheim, and allow you to ride - wait for it - dragons. Other tasty tidbits rumored to appear in the add-on include new armor types - Bonemold, Chitin, Nordic, and Stalhrim - and the ability to cast spells while mounted. New enemy types also appear in the updated code, though it's more difficult to get excited about those without actually seeing them in action. Solstheim is a large island located just northeast of Skyrim, so it wouldn't be crazy to think that Bethesda would add it as a playable area, especially if new story content demanded it. Of course, given the flimsy nature of the evidence at hand, we wouldn't go all-in on this particular rumor just yet. The lines of code that were allegedly found, while tantalizing, can be easily misinterpreted. 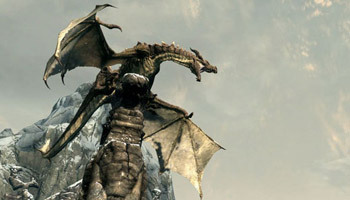 Still, it's impossible to not raise an eyebrow at the prospect of flying our very own dragon around Tamriel, wreaking havoc at every turn.